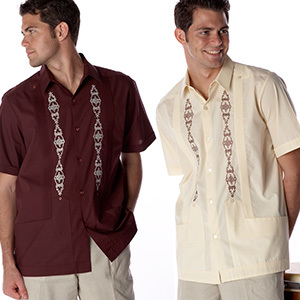 Embroidered Guayabera style – Unique front embroidered guayabera shirt style with the two front pockets, pin-tucks front and back and decoration all around including the side slit. Front pin-tucks (alforzas) – Two rows of traditional guayabera pin-tucks. Back pin-tucks (alforzas) – One centered wide row of traditional guayabera pin-tucks. Pockets – Two bottom pockets. Decorative buttons – Decorative guayabera style buttons one on each pocket, at the beginning and end of pin-tucks lines and on three on each of the side slits. Designed with a unique front decoration a shirt created with the tropical climate in mind, this shirts has now become a cultural representation of Cuba, Mexico and Most of Latin America. Superior versatile design easy to wear style, a vacation on a shirt historically adapted thru the years with an island, and resort relaxed look. Crafted by expert hands Made in Mexico with pride. A GUAYABERA SHIRT THAT FITS YOU RIGHT! Regular fitting done right - Designed with a regular american sizing standard, this shirt will fit you! Small batch production – Produced in our small family factory in Mexico in small batches, we restocked these shirts every two weeks. Hand made – Each shirt is hand cut and hand sewn. Dress up or down – Wear it with slacks and dress shoes for a formal look, dress it down with jeans or even shorts for a tropical chic look. Lovely Shirts – These shirts are lovely, well made and look great. Excellent Value – Very comfortable, looks great, excellent value. Spot on sizing – Very good quality and sizing is spot on. Visiting Miami or Cuba - Great shirt to throw in your bag for those hot Havana afternoons sipping mojitos! Havana Party – Have you been invited to a Havana Nights party and are not sure of what to wear? Take this shirt with any fedora and you are in! 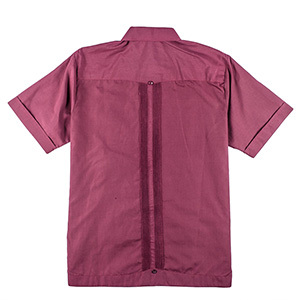 Most customers used this Guayabera Shirt at traveling to Cuba or the Caribbean, cruise attire, Traditional, Havana nights gala and a night in Havana. Beautiful. Just as described. Thank you so much. These shirts are lovely, well made and look great. What a pleasure doing business with your company. Live Chat was so helpful. Very nice it was just as I expected and came quickly. Very comfortable, looks great, excellent value! Bought this for my husband, he was so surprised and loved it. Very good quality and sizing is spot on. Will definitely be getting him more.